It was time to fly and explore again. Explore the country of Mozart, Strauss, Swarovski, Marie Antoinette, Maria Theresa and Elisabeth, Empress of Austria and Queen of Hungary, to name a few of the most famous Austrians. Vienna is naturally full of history, stunning architecture and Viennese charm. Vienna State Opera or Wiener Staatsope is incredibly impressive building, their famous stage offers a different opera and ballet every day! From April to September, around 150 performances are screened live on Herbert-von-Karajan-Platz in front of the opera building on a large screen for free. Same as in London's Trafalgar Square, which I always go to without a doubt. The Hofburg Court Palace was the seat of Habsburg power. The Burggarten was made after Napoleon's army demolished the defensive structures which previously occupied the land. There is a Mozart Memorial in the gardens and a butterfly house or Schmetterlinghaus with a cafe next to it. The Hofburg in Vienna is the official seat of the Austrian President.You can discover numerous museums, popular Sisi Museum of the famous Empress and Spanish Riding School, the only institution in the world where the classic equestrian skills has been preserved and is still practiced in its original form. It is an unforgettable experience of precision of movement of the Lipizzan horses in perfect harmony with the music. If you want to experience something very special, put this in your diary: on 26th June 2015, the Spanish Riding School celebrates the 450th anniversary of its first mention with a grand gala on Heldenplatz. Vienna holds lots of memories for me, my gran dad lived there and I used to visit him when I was little. We would stroll around the city hand in hand, eat cakes in Aida, say prayers in St. Stephen's Cathedral, Stephansdom where we would sit quietly and be totally enchanted by the beauty around us. 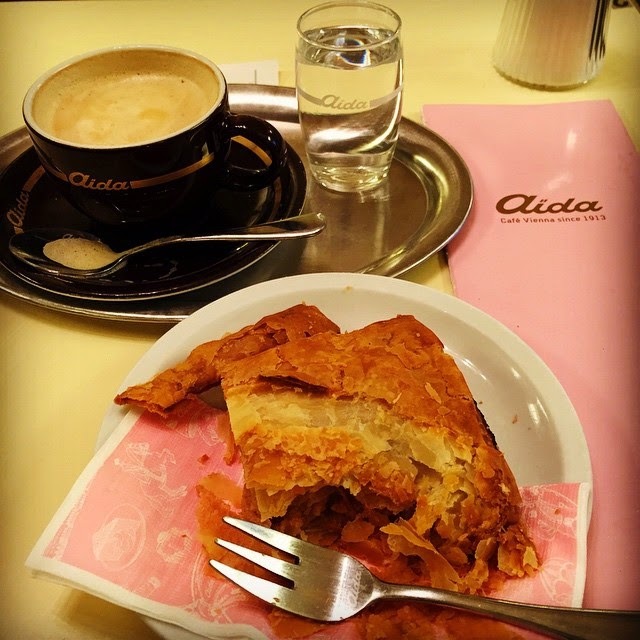 I was looking forward to a good apple strudel in Aida for weeks and weeks. And Lord was it good. So delicious in fact, I had two. 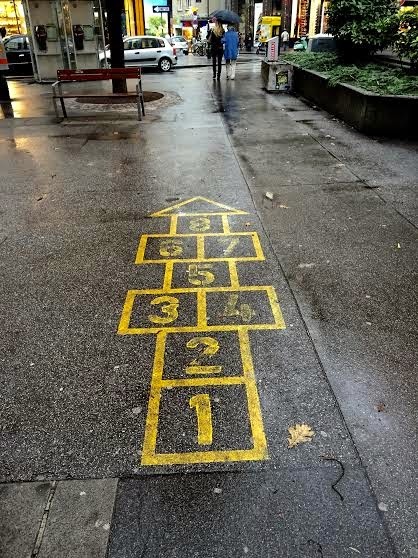 To burn it all off, I walked through the city despite the rain and feeling out of breath after a game of hopscotch (who would resist?) and discovered more and more of this city's charm. Cute little cafes, numerous chocolatiers, hidden courtyards, fantastic souvenir shops, and even got papped! I am warning you - there are serious temptations everywhere you turn. 'Mozartkugel' or 'Mozartbonbon' must be the most famous Viennese chocolate - perfectly round ball of pistachio marzipan covered in a layer of nougat, coated in dark chocolate. De-li-cious! So little time, so much to see. Until next time Vienna, Auf Wiedersehen! Heading back, up in the skies speeding through the clouds of white cotton fluff, don't you just love watching the clouds float through the sky and letting your mind wander? Seatbelt, quick! We are landing! Vienna looks beautiful! Nice pictures. Is the shopping good there? Lovely post! Vienna has some really nice places, and you captured them very well. Never been there, but it sure looks amazing! - MĐV hay vong em be tu dong là sản phẩm tuyệt vời, MĐV hay thiet bi dua vong tu dong dễ sử dụng, vong dua tu dong ngày càng “được lòng” nhiều bậc phụ huynh bởi tiện ích của vong ru tu dong cho be. Những lợi ích của may dua vong mang lại là vô cùng thiết thực. Và máy đưa võng tự động An Thái Sơn luôn cung cấp máy đưa võng chất lượng nhất TP.HCM - địa chỉ bán máy đưa võng giá rẻ cho trẻ em.